Excerpt: 'The Maytrees: A Novel' Annie Dillard's second published novel "swells with beautiful images, of the land, the sea and the constellations," writes Alan Cheuse. "Dillard has written an elegant and, as we might expect from this brilliant and unusual stylist, quirky philosophy-minded beach-shack love story." See book critic Alan Cheuse's reading picks for the season. It began when Lou Bigelow and Toby Maytree first met. He was back home in Provincetown after the war. Maytree first saw her on a bicycle. A red scarf, white shirt, skin clean as eggshell, wide eyes and mouth, shorts. She stopped and leaned on a leg to talk to someone on the street. She laughed, and her loveliness caught his breath. He thought he recognized her flexible figure. Because everyone shows up in Provincetown sooner or later, he had taken her at first for Ingrid Bergman until his friend Cornelius straightened him out. He introduced himself. — You're Lou Bigelow, aren't you? She nodded. They shook hands and hers felt hot under sand like a sugar doughnut. Under her high brows she eyed him straight on and straight across. She had gone to girls' schools, he recalled later. Those girls looked straight at you. Her wide eyes, apertures opening, seemed preposterously to tell him, I and these my arms are for you. I know, he thought back at the stranger, this long-limbed girl. I know and I am right with you. He felt himself blush and knew his freckles looked green. She was young and broad of mouth and eye and jaw, fresh, solid and airy, as if light rays worked her instead of muscles. Oh, how a poet is a sap; he knew it. He managed to hold his eyes on her. Her rich hair parted on the side; she was not necessarily beautiful, or yes she was, her skin's luster. Her pupils were rifle bores shooting what? When he got home he could not find his place in Helen Keller. He courted Lou carefully in town, to wait, surprised, until his newly serious intent and hope firmed or fled, and until then, lest he injure her trust. No beach walks, dune picnics, rowing, sailing. Her silence made her complicit, innocent as beasts, oracular. Agitated, he saw no agitation in her even gaze. Her size and whole-faced smile maddened him, her round arms at her sides, stiff straw hat. Her bare shoulders radiated a smell of sun-hot skin. Her gait was free and light. Over her open eyes showed two widths of blue lids whose size and hue she would never see. Her face's skin was transparent, lighted and clear like sky. She barely said a word. She tongue-tied him. She already knew his dune-shack friend Cornelius Blue, knew the professors Hiram and Elaine Cairo from New York, knew everyone's friend Deary the hoyden who lived on the pier or loose in the dunes, and old Reevadare Weaver who gave parties. Bumping through a painter's opening, picking up paint at the hardware store, ransacking the library, she glanced at him, her mouth curving broadly, as if they shared a joke. He knew the glance of old. It was a summons he never refused. The joke was — he hoped — that the woman had already yielded but would set him jumping through hoops anyway. Lou Bigelow's candid glance, however, contained neither answer nor question, only a spreading pleasure, like Blake's infant joy, kicking the gong around. Maytree concealed his courtship. On the Cairos' crowded porch, she steadied her highball on the rail. He asked her, Would she like to row around the harbor with him? She turned and gave him a look, Hold on, Buster. He was likely competing with fleets and battalions of men. Maytree wanted her heart. She had his heart and did not know it. She shook her head, clear of eye, and smiled. If he were only a painter: her avid expression, mouth in repose or laughing, her gleaming concentration. The wide-open skin between her brows made their arcs long. Not even Ingrid Bergman had these brows. The first few times he heard her speak, her Britishy curled vowels surprised him. He rarely dared look her way. One day he might accompany Lou Bigelow from town out here to his family's old dune shack. He was afraid his saying "shack" would scare them both. Without her he already felt like one of two pieces of electrical tape pulled apart. He could not risk a mistake. Robert Louis Stevenson, he read in his Letters, called marriage "a sort of friendship recognized by the police." Charmed, Maytree bought a red-speckled notebook to dedicate to this vexed sphere — not to marriage, but to love. More red-speckled notebooks expanded, without clarifying, this theme. Sextus Propertius, of love: "Shun this hell." From some book he copied: "How does it happen that a never-absent picture has in it the power to make a fresh, overwhelming appearance every hour, wide-eyed, white-toothed, terrible as an army with banners?" She was outside his reach. Of course she glared at Maytree that fall when he came by barefoot at daybreak and asked if she would like to see his dune shack. Behind his head, color spread up sky. In the act of diving, Orion, rigid, shoulder-first like a man falling, began to dissolve. Then even the zenith and western stars paled and gulls squawked. Her house was on the bay in town. He proposed to walk her to the ocean — not far, but otherworldly in the dunes. She had been enjoying Bleak House. Men always chased her and she always glared. She most certainly did not ask him in. His was a startling figure: his Mars-colored hair, his height and tension, his creased face. He looked like a traveling minstrel, a red-eyed night heron. His feet were long and thin like the rest of him. He wore a billed fishing cap. An army canteen hung from his belt. She had been a schoolgirl in Marblehead, Massachusetts, when he went West. —Just a walk, he said, sunrise. We won't need to go inside. In his unsure smile she saw his good faith. Well, that was considerate, brickish of him, to say that they would not go in. She agreed. She had not seen the dunes in weeks. Maytree suggested she bring, as he did, a pair of socks, to provide webbed feet, and wear a brimmed hat that tied. In predawn light she saw the sunspokes around his eyes under his cap. 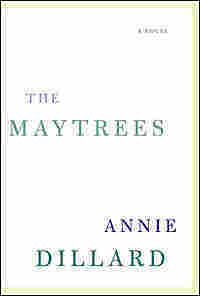 The foregoing is excerpted from The Maytrees by Annie Dillard. All rights reserved. No part of this book may be used or reproduced without written permission from HarperCollins Publishers, 10 East 53rd Street, New York, NY 10022.